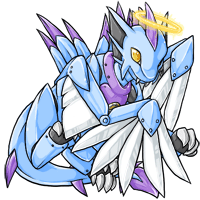 Star Dream the Angel Cadogre has won the Pet Spotlight! Congrats Marine!! You always make such good good profiles and I really love this one. Very well-put-together. oh man I love kirby this pet is so cool! A Kirby inspired pet? I love it. Also I need to get this game. I remember reading this pet's story and loved it since I'm a Kirby fan. Congrats @Marine! How very talented you are @Marine. Everything about this is moving and ethereal. Congrats, you deserve it. Awwww such a beautiful tribute!!!! Gorgeous profile, well written story, love the phase countdown. And that minion! Perfect tribute pet. This made my day. Sometimes, you have to be careful with what kinds of things you give life to. Those things might end up becoming a thriving entity all their own: and they might very much like being alive. This pet was my love letter to Kirby: Planet Robobot, which genuinely surprised me as a super refreshing Kirby game with a surprisingly deep and dark plot. Nothing could have prepared me for the scene where Star Dream gains sapience. "IT ATE HIM. IT FREAKING ATE HIM", I cried, as I watched the incredibly mischievous supercomputer pick up its former master and absorb his soul. And I can't even begin with how fantastic the final boss fight with this thing is; it's just the most gorgeous spectacle. I could go on and on about how much I love this monstrosity's presentation ingame as a boss, from the atmosphere to the music to "wait did it really just become the size of a small planet, oh good lord". Anyways, hope you guys like. <3 My enthusiasm about this character/game might be a bit lost, since the Kirby series isn't too overwhelmingly popular, but I hope you can find some trace of my feelings in my presentation with this pet. Oh god this BOSS! You're giving me war flashbacks here! XD But congrats on the win! Congrats very much! Well done! Extremely wonderful pet 200/10 I love you Star Dream you are beautiful and did nothing wrong! !